December | 2009 | 50 Westerns From The 50s. Too good to stick on your AT&T payments. I’m so happy about this, which my wife just brought to my attention. 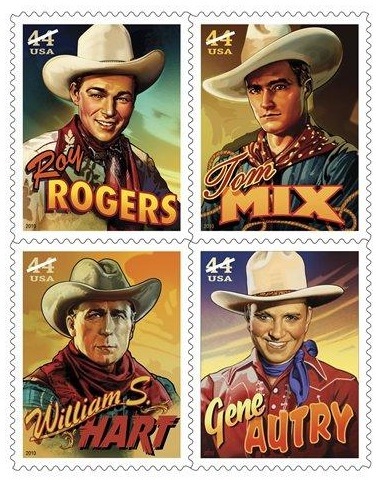 Four of the greatest Western stars ever are being immortalized on postage stamps — William S. Hart, Tom Mix, Gene Autry and Roy Rogers. Time to resurrect the lost art of letter-writing, if for no other reason than to stick Roy on an envelope. A little worthless trivia. Tom Mix played a Pony Express rider in The Pony Express Rider (1916). Rogers did the same in Frontier Pony Express (1939). And in Gene Autry’s final feature, Last Of The Pony Riders (1953), he plays a former rider watching the service pass the torch to the stagecoach and telegraph. The stamps come galloping to your local post office in April. 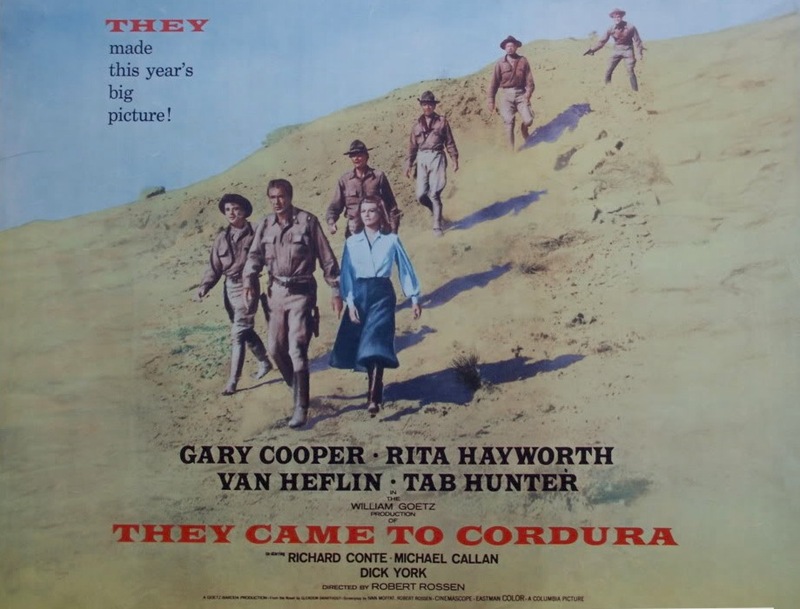 They Came To Cordura (Or Why Bewitched Had Two Darrins). Came across this today, from an old Filmfax interview, about York and They Came To Cordura (1959) — and how he had to part ways with Elizabeth Montgomery. But it did hurt. Bad. 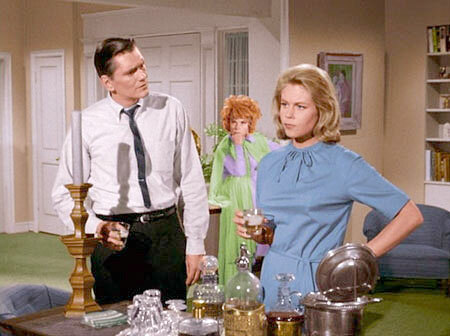 Years later, after an episode on the set of Bewitched, York was rushed to the hospital and eventually released from the series. His career, and his health, never recovered. York was quite a guy, and his story is an inspiring one. And They Came To Cordura is quite a picture. How could it not be with that cast? Gary Cooper, Rita Hayworth, Van Heflin, Tab Hunter? They say it was mutilated by Columbia and that a longer, much better cut exists somewhere. If you happen to be in Brookfield, Wisconsin. And it happens to be August of 1955, you couldn’t do any better than this: Wichita and The Dam Busters. And a cartoon, too! 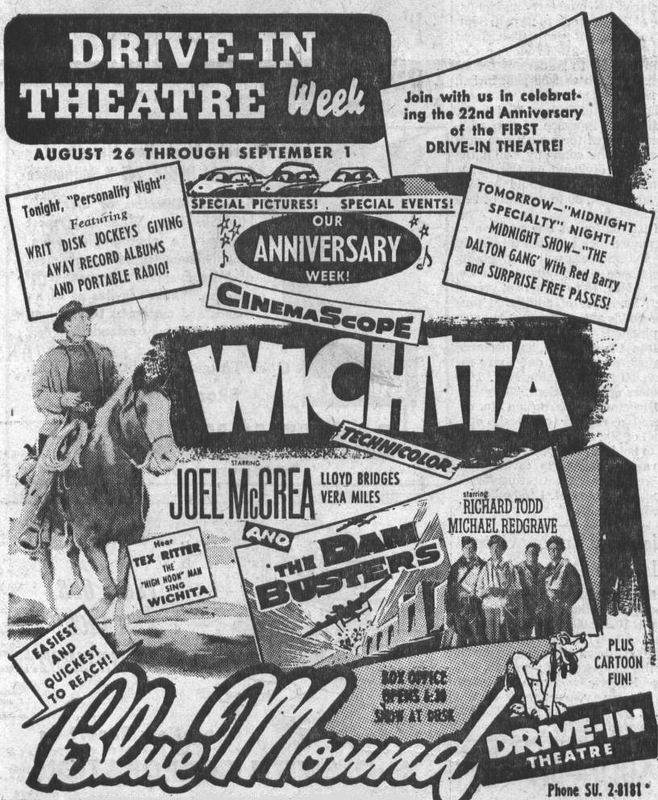 With McCrea as Wyatt Earp, Jacques Tourneur directing, CinemaScope and Technicolor, and the whole thing clocking in at just 81 minutes, Wichita has a lot going for it. The only problem with The Dam Busters is it’s not a Western. Aside from that, it’s terrific. Got this from the site Wisconsin Drive-In Theaters. This is an amazing source of drive-in information, chock full of old ads and flyers. I’m still making my way through it all. Stop by and, if nothing else, check out the story of the 41 Twin. Just wanted to wish you all a Merry Christmas. Hope Santa brings you the cap guns and John Wayne DVDs you asked for. 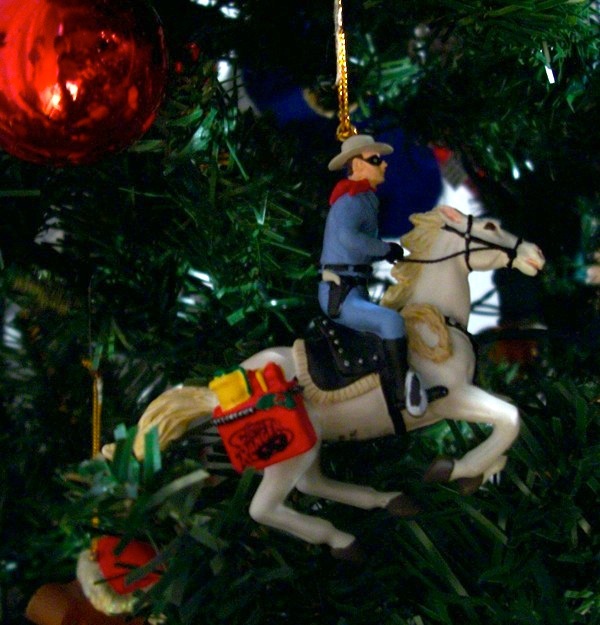 This ornament graces my tree every year. It always reminds me of the Super 8mm print of The Lone Ranger I got one year — and that this is the time for Jay Thomas to hop on Late Night With David Letterman to tell his terrific Lone Ranger/Clayton Moore story, which you can see here. 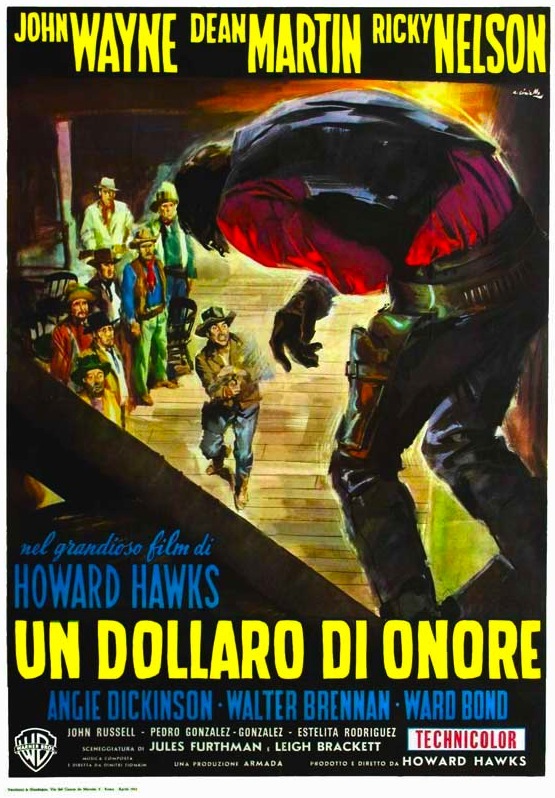 One of those cheesy Italian-to-English translation things on the Web says that title translates to “A Dollar Of Honor.” By whatever name, it’s Rio Bravo, which I haven’t mentioned in weeks. Sorry for the delay. This depicts the scene where Dude (Dean Martin) finds the bad guy by noticing the blood dropping into the mug on the bar. It’s my favorite part of the picture. Actually, my favorite part lasts 141 minutes. DVD Review: Carson City (1952). People, especially critics, are funny about movie clichés and formulas. While we all complain when a film seems predictable, formulaic or clichéd, the most popular films often adhere to a pretty strict formula. Hollywood musicals. The Bond films. Slasher flicks. Romantic comedies. The thousands of series Westerns. The list goes on and on. So if the clichés and formulas themselves aren’t the problem, maybe it’s laziness we have issues with. Bring a fresh approach to the same old thing, however slight, and we’ll lap it up. But crank out that same old thing, the same old way, and you run the risk of being nailed to the wall. 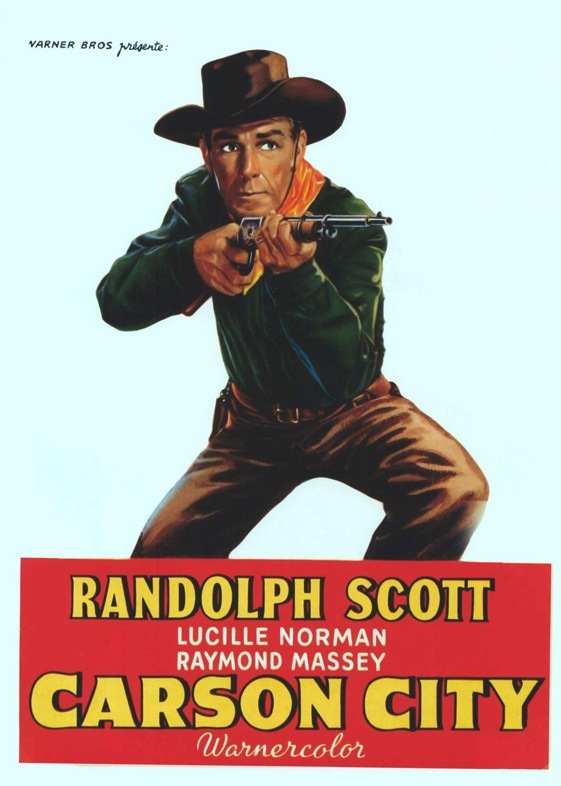 Carson City (1952), the second of six Randolph Scott Westerns directed by Andre De Toth, helps illustrate this. It’s certainly got its share of clichés. A saloon brawl. A shootout or two. A mineshaft accident. A stagecoach holdup. A train robbery. It’s all there, along with a pretty typical lost-love subplot. But thanks to Scott’s presence and De Toth’s always-tight direction, you’re pretty satisfied when “The End” pops up. The Champagne Bandit (Raymond Massey)and his gang are robbing stagecoaches to get the gold dust being hauled out of Carson City to nearby Virginia City. Thinking that a railroad line would result in fewer holdups, a banker hires engineer Jeff Kinkaid (Scott) to lay the track and get the gold flowing again. This proves unpopular with the townspeople — and the Champagne Bandit. In Andre De Toth’s capable hands, all this predictability flies by before you have enough time to notice how familiar it all is. His stuff is lean, fast and cynical — and his Scott pictures hint at the films Scott would later make with Budd Boetticher. There seems to be renewed interest in De Toth these days, which isn’t surprising. He’s certainly worth seeking out. I’d recommend Pitfall, Man In The Saddle (another Scott), Crime Wave, Day Of The Outlaw and Play Dirty. In the middle of this rediscovery, Warner Archive has released Carson City as part of its on-demand DVD-R program. While it’s a bare-bones release — the film and that’s it — it’s a nice one. Carson City was the first film in WarnerColor (more on that), and the transfer is crisp and sharp. The interior scenes look good, lush even, while the contrast in the exteriors is a little harsh — giving you a good idea of how WarnerColor looked on film. It’s presented full-frame, which is correct for 1952. There’s a little dust from time to time, which I kind of like. Having grown up with films around the house, usually 16mm, I have a soft spot for a little wear and tear. 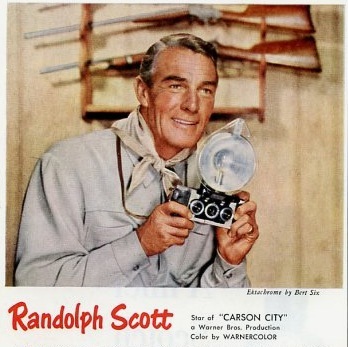 It’s hard for me to be objective with a Randolph Scott movie. Carson City’s a good one. The DVD’s fine. And you can get it here. Just saw that Jennifer Jones, who got her start as Phylis Isley in New Frontier (1939) with John Wayne, has passed away at 90. She won as Oscar for The Song Of Bernadette (1943) and starred in David O. Selznick’s mammoth Western Duel In The Sun (1946, that’s her with Gregory Peck), which brought with it another Oscar nomination. She’d marry Selznick in 1949. Her full obituary can be found here. What’s more, Greenbriar Picture Shows has an excellent series of posts about her.